There was last hoop drama today when Richard Peperell won his first GC singles tournament title with viceroy in the 3+ Red Ball. He beat top seed Raymond Wood and managed to survive two 'full penalty - wrong ball' errors in an exciting 19 point final. There was a double celebration as Richard also reduced his handicap to the 3 mark, only recently re-attained by Wood. The beaten semi-finalists were Raghu Iyer and the day's surprise package Philip Allison (who was the second highest handicapper in the event). Members will be sad to learn of the death of the former Croquet Chairman and very long standing member. A doyen of our club, Keith Noble was Chairman in 2007 - 2008 and was made an Honorary Member in recognition of his longevity of service. He introduced many players to AC and was always a willing coach to improving players. No mean player in his own right, Keith appeared in five consecutive finals of the Club AC Championship (between 2001 and 2005), winning the Advanced Singles 'Boucher Trophy' twice. Away from croquet, Keith was very interested in Archaeology and also did charity work with his wife in the book section of Oxfam. The details of the funeral arrangements will be notified in due course. League newcomers Ryde 'B' provided very tough opposition for PCC 'A' today on a sun-baked Isle of Wight. On paper, our side (handicaps -2, 0 ,0 ,0) was much stronger that theirs (handicaps 3, 3, 4 4) but all four of the hosts played superbly throughout. Chris Roberts and Roger Goldring were held to one game all in their morning doubles, and only secured that rubber 7-6 at the end of the day when the match result had already been decided. Helena Fensome surprisingly lost her morning singles, 6-7, 6-7 and Mike Fensome needed a third game to win his. Helena made amends in the afternoon and Chris also won in straight games, but Roger who messed up at hoop 13 of his decider on he show court, to leave the fixture result still in the ballenece at 3-2. Eyes turned to Mike on he adjoining court, where again he had been taken to a third game. Thankfully he on it eventually to secure the fixture result allowing the outstanding final game of the doubles to be played for the extra half league point, for a final result of 5-2. Along side the League match, a friendly shadow fixture was played (to the same format as the league), but that need with a reverse scoreline of 2-5 to Ryde. John Maguire was our hero, winning both his singes matches and the score sheet reveals that nearly all the games in this fixture had excitingly close margins. This was an excellent fixture and enjoyed by all our team of gentlemen of a 'advanced age'. Raghu Iyer reports: Phyllis Court scored a match victory in the friendly home handicap fixture with Roehampton today by 4 games to 2. Honours were shared in the morning with TJ Johanssen and June Robinson winning their doubles , but Raghu Iyer and Ricahrd Peperell coming up second best in theirs. In the afternoon, TJ won +26, June won +10, Raghu won +4 on time and Richard lost (on-time again) to the same narrow score-line. 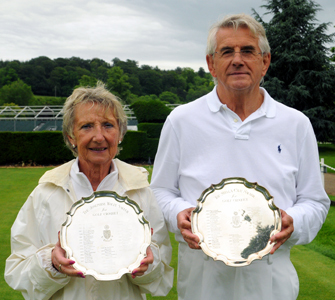 Hugh Crook and Delia Norris were undefeated through out this tournament and were worthy winners ahead of seven other pairs. They defeated a very game Helena Fensome/Nina Cox combo in a close final, that featured good clearances and ball placement from both sides. Crook's three long range center-ball hits probably swung the final. In fact, most pairs choice of clearance rather than limply trying to block shots by crowding ever closer the hoop, was good to see, and in that respect was a step up from performances of recent years. This event was run as a 'minimum long handicap of 10+' for the second year and it seems a popular format, allowing as it does, for evenly matched pairs in the mid-range of handicaps or high/low combinations at the other extreme (exampled by the Fensome/Cox and Mike Fensome/Margaret Broughton pairings). We were lucky with the weather too, as the heaviest rain passed us by and we generally speaking,'got away with it'. The details of the funeral arrangements for Keith Noble's will have been notified by Maureen. The funeral will be held on Thursday 23 June at 1115 aat Reading Crematorium. Refreshments will be provided in te Finlay Suite. All are welcome. The funaral directors are Tomalin and Son - family flowers only - donatons to the RNLI will be welcome. Raghu Iyer has published the playing schedules for the AC season-Long competitions - you can see these via the buttons in the black panel on the front page. Roger Goldring made his debut today at the GC's most prestigious singles tournament of the year - the British Open at Southwick (near Brighton). He joined seasoned campaigners Helena Fensome and Chris Roberts in a good quality field that includes the World no.1 Reg Bamford, the World AC Champion Stephen Mulliner and former Women's World Champion Rachel Rowe. There were three rounds of block matches today, Roberts won his first (best-of-three) match 2-0, Fensome won her third one 2-1, whilst Goldring's best was taking Rachel Rowe to 5-7 twice in defeat. The Open Championship continues for the a further three days. Chris Roberts qualified for the Championship knock-out today with two more match wins to complete his block programme on 5 wins from 7. His prize though was a first round match (and defeat) against England International Tobi Savage, who hit from everywhere and, on this form, looks likely to be a serious challenger for the Open title. Roberts entered the Bowl event for first round losers and beat Norway's Roar Michaelson in two tough games. Roger Goldring finally picked up a win in his block, impressively 'scalping' -2 player Richard Brooks in his last match and Helena Fensome completed her block program without adding to her two previous wins. Goldring and Fensome then played in the plate event where the former really upped his game to record three (single game) wins, whist the latter's form dropped in three defeats. 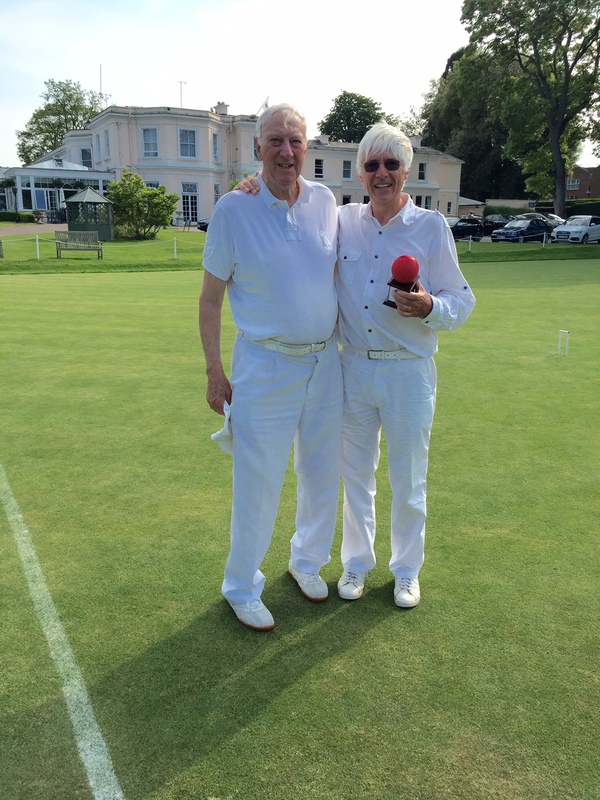 There was an exciting all Phyllis Court match today when Helena Fensome and Roger Goldring went 'head to head' and right to the 13th hoop of the deciding third game. The match couldn't have been tighter; Goldring won the first 7-6, Fensome the second by 7-4 and finally she pinched the third again by the one point margin. Chris Roberts won both his matches today but was denied a third when the heavens opened, flooded all the courts, and halted proceedings prematurely at 1630. Chris Roberts beat Simon Carter of Dulwich 2-0 in the semi-final of the Bowl event (for qualifiers to the main knock-out who lost in the first round), but then lost in the final to his club mate Guy Scurfield by the same score. Roger Goldring couldn't maintain yesterday's winning streak and lost a morning game to drop our of contention in the Plate event, but will remember his first British Open for his previously detailed successes. Helena Fensome didn't play today. The main Championship event was a very high quality affair indeed, with World no.1 Reg Bamford failing to make the semis that featured his victor Harry Dodge (19 years), Tobi Savage (26) and Jamie Burch (also mid-20s) and the eventual champion Stephen Mulliner who at 62 was most certainly keeping up the fight for the 'old' men. PCC 'C' had a great result today beating Dogmersfield 10-2. Report to come . . .
Raghu Iyer was sick today and so couldn't partner Harry Midgley as Phyllis Court's representatives at Hamptworth today. A stand-by player Glynes Hassel of Dogmersfield was called-in to pair up with Harry in this AC handicap event, which was eventually won by Pat and Ray Fidler of Hamptworth. The Norrises lost just one game all day at Hamptworth, but crucially it was the final of the Solstice Doubles tournament (for pairs with a combined handicap of 6). Along the way, they defeated the other Phyllis Court pair Frances Colman and Raymond Wood who had come second in their block, causing an earlier than planned meeting of the top two seeds at the quarter-faail stage (which curiuosly was exactly what happened in the British Open this weekend!). Rain dampened proceedings but apparently not overall enjoyment in the afternoon as a team from Wingrave beat Phyllis Court (The Norrises) 7-3 in the final. A full report will appear on the SCF website (with a link button here) in due course. 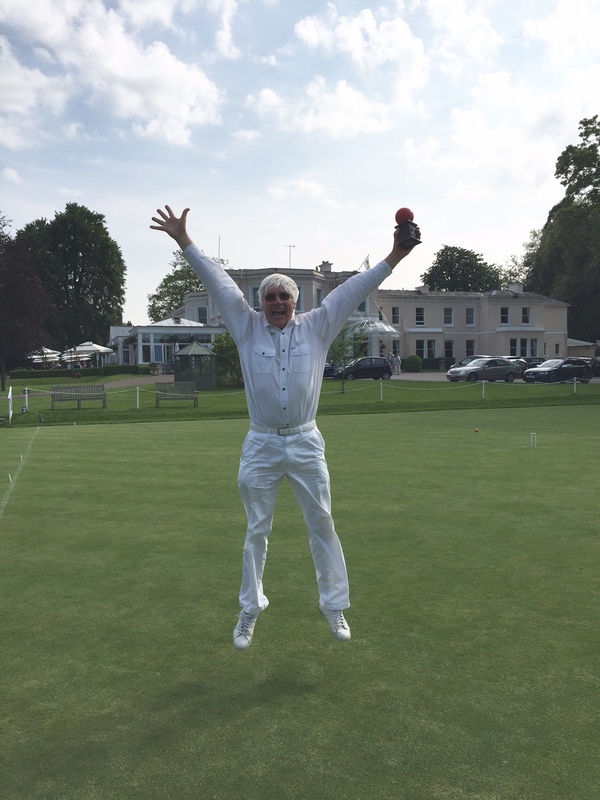 There was a double celebration for Ian Norris today when he survived all his oppenents' extra turns to win the Guildford Handicap 'PJ's Pot' tournament, but reduced his handicap to a new low of -1. Well done Ian and great double achievement! There was heartache for our Murphy Shield team today when a spirited afternoon come-back the fell just short and they exited the competition. In a quite dreadful day the team ventured through pouring rain to Guildford and Godalming CC to find that surprisingly the sand based courts drained so well, they were playable. Phyllis Court were 0-3 down at half time and 'had it all to do' with victories required in all four of the afternoon singles rubbers. All four went to the deciding game of three - three were won but the other lost and so the slim 3-4 scoreline was in the host's favour. 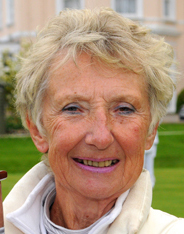 PCC 'Murphy Shield' - Frances Colman (2), Raymond Wood (3), Colin Morgan (5), Raghu Iyer (5). Our visitors from the Hillsboro Club, Florida, enjoyed some doubles games partnering Phyllis Court players on day Game Day 1 (of 2) of their visit this morning. All ten of the pairs were given a team name of a 'Great Briton' and duly Isambard Kingdom Brunel (Mike Fensome and Hillsboro's Elena Vandervoort) won the morning from Sir Isaac Newton (Nina Cox & Hillsboro's Bea Edgar). Both pairs were undefeated but Brunel had the better net points score. In the afternoon, everyone enjoyed a trip on the River. Tomorrow sees more of the same, with some different PCC players and pairings swapped about. It was 'more of the same' with our Hillsboro visitors this morning, with three more reunds of doubles game. This time Pat Eades, Mike Fensome and Dianne Browne with their American partners (respectivly playing as Great Britons 'Queen Elizabeth I', 'Winston Churchill' and 'Owain Glyndwr'') won all their games. Blewbury's Andy Robertson was undefeated in his seven games and was a worthy winner of the fourth running of this popular two-day tournament. Frances Colman pushed him the closest in the last round game and lost by just three hoops on time. She won 3 games from 6, which was matched by Chris Roberts, and Raghu Iyer won twice. In addition to players from the two host clubs, this season's participants also hailed from Watford and Edgbaston (Birmingham). Members will be sad to learn of the death of the former player and long standing former member. the club. This is now mounted on a wooden plaque and provides the trophy for an annual tournament 'Hugh’s Mallet'. Terje Johansen said "He was a gentleman of the highest order and was an inspiration to me and many others through his good nature and very positive attitude. Norway, was just amazing. He was a wonderful man with a great perspective of what matters in life’. clearance shots which he hit like a bullet. 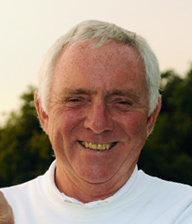 He was also very keen on playing singles and pressed for a Club Singles Tournament which was introduced with great success by the Committee in 2001. Our thoughts go out to Rosemary and his daughter Katherine at this sad time. His funeral is to be at St. Mary’s Church, Henley on Friday 15th at 11.OO am.